Macwan introducing "Gujarat Vikas Samachar"
Out of 112 cases of social boycott and forced migration of Dalits across Gujarat over the last 28 years, ever since the anti-atrocities Act came into force in 1989, as many as 85 of them took place during a little more than 14 years when Narendra Modi was chief minister of Gujarat, from October 2001 to May 2014 (click HERE for detailed table). Analysing number of cases of social migration and forced migration, the story shows that in 1989-90, when Congress ruled, there was just one incident of social boycott and forced migration of Dalits. Then, for six months in 1990, when then Janata Dal (Gujarat) leader Chimanbhai Patel led a coalition government with the BJP, there was no such incident. Thereafter, between October 1990 and 1995, when Patel merged his Janata Dal into the Congress and formed the government, followed by the chief ministership of Chhabilbhai Mehta, six incidents took place, three each in Mehsana and Bhavnagar districts. Under the chief minister of Keshubhai Patel and then Suresh Mehta (both BJP) in 1995-96, there was no incident of social boycott or forced migration. Followed by this, for less than two years, in 1996-97, the Rashtriya Janata Party government, under the breakaway group of Shankarsinh Vaghela, came to power with Congress support. During this period, six incidents took place. In 1998, Keshubhai Patel returned to power as BJP chief minister, and under him, till 2001, five incidents of social boycott and forced migration took place. After Modi left to Delhi in May 2014, and Anandiben Patel became Gujarat chief minister between 2014 and 2016. Under her, as many as 10 incidents of social boycott and force migration of Dalits took place. Since August 2016, when Vijay Rupani became chief minister, five more incidents took place. The story gives district-wise breakup of the number of such incidents – the highest being in Bhavnagar district (14), followed by Amreli and Banaskantha districts (12 each). Then, in Porbandar, Ahmedabad and Mehsana districts, seven incidents each took place. Releasing “Gujarat Vikas Samachar”, to be distributed in thousands across Gujarat, Macwan told media, the purpose of bringing it out is to suggest how the most deprived sections society have remained unaffected by “development”, as claimed by the powers-that-be, under successive governments. 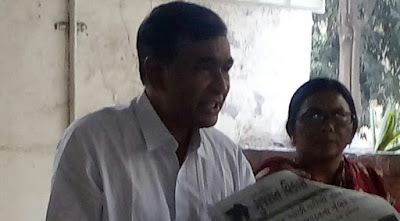 Macwan said, stories of landless workers, saltpan workers, vegetable vendors, majority of whom belong to the Dalit and other deprived sections., do not find reflected in the mainstream media. 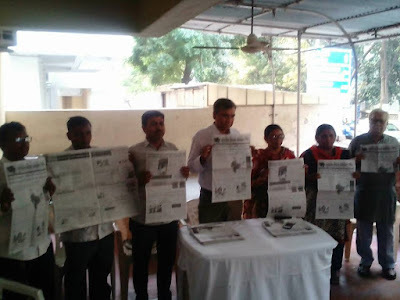 “Our effort is to bring these stories to light, and send them across Gujarat ahead of the state assembly elections, so that people can ask those who come seeking vote as to what they had done for them”, he said. “The stories include that of a 12 year old tribal boy who got killed as he met with an accident on being forced to drive a tractor on a rich Patel’s farm. The landlord offered just Rs 5,000 as compensation. Worse, there is a board in the village which says that those who pay wages more than Rs 100 would be fined Rs 5,000”, he said. Giving a graphic picture of where is Gujarat placed in malnutrition – “just one ahead of Chhattisgarh”, to quote from the “newspaper” – it carries stories by Niruben Chaurasia of Bhavnagar, whose survey shows that only those who give bribe are offered jobs; and by Manjula Makwana of Jasdan, who looks into how widows in five villages with a monthly pension of Rs 1000 have to make do their living. Then, it has a story by Narendra Parmar of Patan, who gives a graphic picture of forced migratin in the district and how they were refused rehabilitation; and by Kalpesh Asuria of Banaskantha, who points toward the high malnutrition rate among young girls in the district and how Dalits were deprived during one of the worst floods which affected the district this year.